Edited by one of the most renowned scholars in the field, Richard Betts' Conflict After the Cold War assembles classic and contemporary readings on enduring problems of international security. 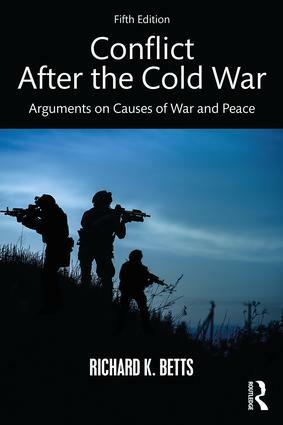 Offering broad historical and philosophical breadth, the carefully chosen and excerpted selections in this popular reader help students engage key debates over the future of war and the new forms that violent conflict will take. Conflict After the Cold War encourages closer scrutiny of the political, economic, social, and military factors that drive war and peace. Original introductions to each of 10 major parts as well as to the book as a whole have been updated by the author. An entirely new section (Part IX) on "Threat Assessment and Misjudgment" explores fundamental problems in diagnosing danger, understanding strategic choices, and measuring costs against benefits in wars over limited stakes. Fred C. Iklé, "The Dark Side of Progress"
G. John Ikenberry, "China’s Choice"
Kenneth N. Waltz, "Why Nuclear Proliferation May Be Good"
Daniel Byman, "Drones: Technology Serves Strategy"
Audrey Kurth Cronin, "Drones: Tactics Undermine Strategy"
Eyre Crowe and Thomas Sanderson, "The German Threat? 1907"
Neville Henderson, "The German Threat? 1938"
Vladimir Putin, "The Threat to Ukraine from the West"
Eliot A. Cohen, "The Russian Threat"
James C. Thomson, Jr., "How Could Vietnam Happen? An Autopsy"
Martin C. Libicki, "Why Cyberdeterrence is Different"
Reading 1.1 The End of History? Reading 1.3 The Clash of Civilizations? Reading 9.7 China: Can the Next Superpower Rise Without War? Reading 10.4 Peace Among Civilizations?